Whether you call us basement remodeling contractors, basement finishers, home renovators, refinishers, or whatever, Total Basement Finishings network of basement remodeling contractors can help you transform your basement finishing ideas into a basement remodeling plan that's fully customized to work for you. Every one of our remodelers are fully trained at our international headquarters in Seymour, Connecticut, view a battery of training videos, and also take a full training course online. Additionally, each of our basement finishing companies is a well-established, locally owned and operated business. When our basement contractors finish your basement, they use only the best mold-resistant, water-resistant, and fire-retardant products in the industry. These are not your ordinary general contractors trying their hand at finishing a basement! Each of our basement experts offers written warranties with the products that guarantee that your system is designed to look beautiful for many decades to come. And with a 50-year warranty against mold and moisture-their solid basement wall panels are guaranteed 100 times longer than other basement finishing systems- even if the basement floods! No other company can claim this kind of confidence in their basement wall product! Our network of basement finishing companies spreads across the United States and Canada. If you'd like a free, no-obligation estimate from a local basement finishing contractor, contact us today! 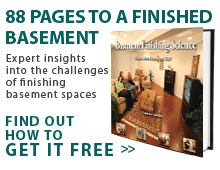 Get started with your basement remodeling planning.